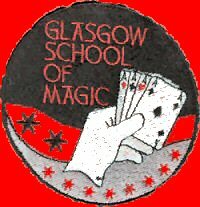 Founded in 1997 and originally called The Glasgow School of Magic, we were born in the back room of the "Annakadabra"
Magic shop in the High Street Glasgow. youngsters, and what rewards they have brought us. "Scottish Young Magician of the Year"
Winners 1998, 1999, and 2000 brother and sister act Kenneth and Catriona Hay. Winners 1999 Ryan Cosgrove, 2001 Matthew Toal, and 2002 Craig McAuley. 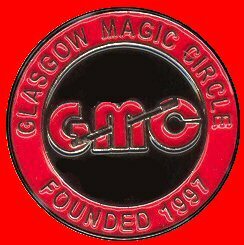 Scottish Association of Magical Societies (SAMS) "Max Raskin Trophy"
Winner in 2000 eight year old Alan Duncan Jr.
recognized as having contributed most to magic in the preceding year. During the years we have produced and staged shows in theatres, schools and church halls resulting in more than. £10,000 being raised for good causes throughout Scotland. Our move to Next Generation in Anniesland allows the club to continue to plan for more exciting shows and events for the future. An excellent venue with superb facilities. From our humble beginnings the club has grown into a true force on the Scottish magical scene. With a growing membership, a superb venue, talented youngsters, and innovative creative magicians on hand throughout the year, our future looks assured. spearhead the way forward for future generations of aspiring magicians. Below are the badges used by the club. The middle badge "Tree Design"
elaborate for club sweatshirt's and badges. The third badge was adopted in 2003. Copyright (c) George Colvan Web master GMC. Permission is granted to copy, distribute and/or modify this document under the terms of the GNU Free Documentation License, Version 1.2 or any later version published by the Free Software Foundation; with no Invariant Sections, no Front-Cover Texts, and no Back-Cover Texts. A copy of the license is included in the section entitled "GNU Free Documentation License".